It’s hard for me to remember right now, how long ago or exactly where I first heard about crop circles, but I do know when their complete fascination became a large part of my life. Off and on over the years, I’ve heard about crop circles, and this phenomenon has always interested me. I’m sure I really first started to learn about them from television, and I have seen several very good TV shows on them over the past 10 years or so. I somehow never really believed that they were all made by “Doug and Dave”, or the “boys from the pub”–although I do acknowledge that some of them are man made. With the death of my husband a few years ago, and the ending of my “professional” career, I found myself going to a wonderful Metaphysics Expo, at the Fairgrounds in Nashville. As I wandered the booths of the many interesting and varied exhibitors, I was drawn to a booth at the far end of the layout. At first I wasn’t sure what was going on in the booth, but then I was drawn into a conversation about crop circles, by people who had actually been in the circles in England! “Are they real? Who do you think makes them?” I asked Denni Clarke, tour leader for Magical Mystery Tours. And to put my myriad questions to rest, she signed me up for her tour. Nine months later I was off to Wiltshire England, an area that reliably manifests a variety of crop circle formations every year, or so I hoped. One of the first things Denni spoke about when she met us off the plane was that it was a “slow year” for formations. While I was visiting this area for one week in July, three circles formed that I was able to personally visit. There were four other pre-existing circles in the area but and we visited the three new circles during my stay. Most of the circles, or formations, are very large. We were in several that I would say are the size of a football field. The crop circle almost always forms an intricate pattern. The physical beauty of a crop circle is hard to ignore once you are exposed to it. The crop is bent over (not broken), in elegant bundles, laid out in symmetrical rows. Each row is bundled, and slightly twisted and placed as if gently and lovingly, next to another bundle of crop. The circles are in patterned formations (not just in small circles in crop); the centers are exquisitely spiraled, and some have “nests” of crop which are also gently twisted in the center. I have the gift of being able to feel vibrational energy that all of life gives off. As I walked into five of the six crop circles, I could feel a change in the vibrational energy from the crop within the circle, as opposed to crop outside of the circle formation. If one is attuned, you will obtain spiritual messages or indications of Spirit, as you come in contact with the circle. Often, as I just approached a circle, I would receive a strong feeling, a centering, a oneness, that wasn’t there within me before coming in contact with the circle. In walking the crop, the labyrinth like feel was continual for me. I went within myself as I related to the crop formation and the symbology it held. 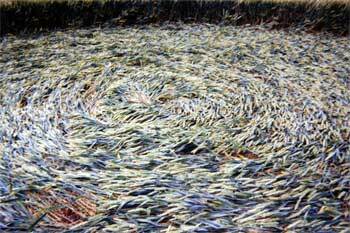 The crop lays in a directional stream in a pattern. As one walks the circle, it feels as if you are walking an energy flow like the current in a river; walking against the lay of the crop is like walking upstream in opposition to the flow. It is very common to find people meditating, or praying, to see groups of people standing holding hands in the circles (this also happens quite frequently in stone circle formations as well). I personally became very sleepy in some of the formations. In one crop circle we visited, all four of our group fell asleep when we sat down to meditate. “What is the purpose of Crop Circles?”I believe there are many levels to Crop Circles. I think they are physical vibrational adjustments to the earth and to mankind. 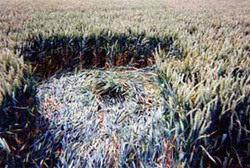 All who visit a crop circle help impart the message of the meaning and the vibrational change to the rest of the world. I strongly believe that there are spiritual attunements being made as well, to the earth. For me, each circle brought a special centering and oneness with the universe that was exquisite. Every crop circle formation, carries with it at least one central theme, with many personal messages. The theme is usually a combination of the pattern of the formation along with the energy vibration of the formation. Circles I visited included one that spoke of “just Being”, of “following the path within”, one which resonated to all of the chords of the Chakras, and when walked, evoked a complete clearing or adjustment to one’s Chakras; there were formations that spoke to musical toning for spiritual adjustment, for the dance between the masculine and feminine energies of life, and to the magic of life. For me, the real meaning behind the circles is as one of my group said, "they are the thumbprint of God." They are yet another miracle for us to explore and know that we are not alone. They are the WOW for us to ponder. An ability to more easily let go of the meaningless drival that used to annoy me in my life. During this trip I also visited sacred sites across England, so some of the vibrational changes I now feel may also have occurred in connection with my visits to these localities, but the total peace and serenity, the oneness with God resonate so very strongly within the circles, that I believe there is a message for mankind from the circles. In the Fall, the season for the circles in England and across the world comes to a close. The grain is harvested from the fields, but the messages, the light and blessings of the crop circles will continue to be manifested to mankind. The circle formations are gone but their effects remain: through the vibrational changes brought by them to the earth, to the people who experienced them, to the images from photographs of the circles for people to meditate upon, and from the grain from those fields that have been forever changed and now become a part of our food chain. The messages simply unfold and I will continue to watch the fields for next season’s blessing of crop circle delight and wonder.